Mathematical questions are very much fun to do. I have seen many students fear Math. However if one is able to learn the basic concepts in Maths then nothing is more interesting than Mathematics. Now if we mix little bit of Logic in Math questions to give a twist then we will can have great set of Maths brain teasers. 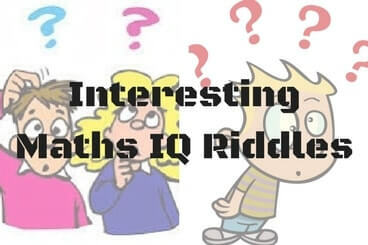 Here are few such Math riddles to give twist to your mind. Level of these Math brain teasers is from 5th Class onward. Any kid which is in 5th Standard or more than 10 years old should be able to solve it quickly. I will be posting the answers to these Math puzzles soon. Try to solve it without looking at answers and post your answers in the comment section of this post. Q2. A man has 20,000 Rs which contains 500 and 1000 Rs notes. If number of 500 Rs notes are 20. Find the number of 1000 Rs notes. Q3. Ahana bought dresses for herself and spent Rs 3000 on them. She had 5000 Rs with her now. she wish to shop for her mother. How much money is left with her to buy gift for her mother? Q8. IF THEM =1234, OLA=567, VAN=879, then find meaning of 65834712. Q9. In a paticular language if FUN is written as UNF, WITH is written as ITHW, then how will PUZZLE be written? 15+3-5x10=50, then find the value of 20+10-6x3=................? Answer of these brain teasers question of math are as below. I have hidden the answers of these riddles. To see the answer, do select the text between the numbers. X=10, Therefore there are 10 notes of Rs1000. 657153324, Logic is a particular value is assigned to the alphabet in PUZZLER and FAN. We should use same numerical value for finding out the answer. Example value of F=6,U=5,N=7,and so on..
Logic is skip count by three of first alphabet will give you fist alphabet of next series and skip count by three of second alphabet gives you second alphabet and so on. Example : A, B, C , D. And M N, O P.
Logic is again value of each number is given as alphabets as 6=L, 5=O, 8=V, 3=E etc. UZZLEP. First alphabet changed its position to last. + is used to subtarct, - is used to multiply and x is used to subtract again.